A robot doing a backflip? That's so last year. In a new YouTube video from robotics company Boston Dynamics, which Alphabet sold to SoftBank last year, a robot is shown hopping over a log and then up a series of blocks, an activity called parkour. This two-legged robot, called Atlas, is the same one that was shown doing a backflip less than a year ago. The video is called "Parkour Atlas," in reference to a popular recreational activity among young people. In a 2007 New Yorker article, parkour is described as "a quasi commando system of leaps, vaults, rolls, and landings designed to help a person avoid or surmount whatever lies in his path." An earlier version of Atlas starred in the Darpa Robotics Challenge in 2015. Teams of researchers added their own technology to the robot, with varying degrees of success. "Robots could replace 800 million jobs by 2030"
About time... So, let's say that’s the challenge all humanity face to keep on developing our soft skills / humane capabilities! ya- like going bouldering.....self satisfaction outside work. Machines have always destroyed jobs and created jobs. Otherwise there wouldn't be such low unemployment in advanced economies like that of the US. This time won't be any different. Of course, the poorest people in the least developed countries have none of these things, but they have none of them precisely because they also do not have robots. Robots will take your job from you, but they will also make you rich. I do not quite agree with the notion that cheaper goods and job cost efficiency go hand in hand resulting too in bigger profits for organizations because what we are seeing is the increased inability of person's who can't or can barely afford the basic human necessities such as food, water and shelter. Even in some of the most wealthy countries, persons continue to be displaced significantly by these so called cost cutting measures which include the abundant uses of artificial intelligence/ technology. Base on what is being observed it is not too long from now, when the general work force would be unable to buy anything because most would be out of jobs and the well run organizations with their abundance of technology, would have little or no customers to sell their products to . Money as we know it would be valueless. Chad, there seems to be some general misunderstandings about how and why robots are introduced into the workplace. Thunder Blade quotes Mr. Ma of Alibaba that robots will take 800 million jobs. That is not quite correct. Robots will likely take 800 million Chinese jobs. And that has the communist party there seriously worried. 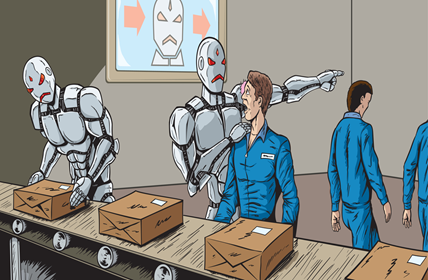 You declare that 'Robots make production more efficient, which lowers the costs of goods." Not quite. Robots still tend to be quite expensive. What robots really do is ensure "repeatability," that each assembly coming down the production line is exactly the same as the previous and the next. Repeatability is what ultimately brings both customer satisfaction and lower costs, - but it takes a while for those benefits to work their way through the production cycle, and the cost benefits to show up (if ever). And the reason for the latter is that the acquisition and set-up costs of those robots has to be recaptured somewhere, before you can see reductions and thus a greater return. You first see robots showing up in areas where the work is heavy, and the lifting and twisting forces to install one piece into another presents risk of injury, and thus a workers' compensation claim, to the manufacturer. So you first saw robots showing up in foundries, where hot metals are sloshed around, and there is this historical pattern of serious injuries and deaths. And next you saw robots in the auto assembly line, where heavy components such as windscreens had to be picked up, lifted, rotated, carried to the auto on the line, twisted, aligned, and dropped into place, while the sealant was applied. That was an area where personal injuries, to the back and the hands, was notorious. And robots were introduced to do the spot-welding where various body panels were assembled to complete the auto body shell. Doing that by a programmable robot ensures a perfect fit, in a product where fit and finish are crucial to sales. Going over to Lincoln and his dirt floor, remember that the US frontier was constantly expanding Westward. So the drill was for the homesteader to burn down his house on the prairie and then send the kids in to rummage through the ashes, to retrieve the nails. The nails were the most valuable part of the house, and you needed them to go build the next house, further West. Nobody is going to spend the money to build a nice planked floor if the structure is scheduled for burning a few years later! But remember that old sea-captains' houses in the ports along the New England coast had cellars, and finely crafted floors, and internal paneling and fireplace sills that would take your breath away. But the sea captain was not leaving the Port of Mystic, so he could and did spend lots of coin on a beautiful home, as you would have in say England. Will robots "make you rich"? The jury is still out on that one. But, inescapably, they will make someone rich. Just might not be you. Thunder Blade quotes Mr. Ma of Alibaba that robots will take 800 million jobs. That is not quite correct. Robots will likely take 80﻿0 million Chinese jobs. As always Jan, you make great posts filled with finely nuanced information! Unfortunately for me, that is not a skill I have much experience in. Often for the sake of brevity, I generalize while taking the liberty to use words with sweepingly wide interpretive possibilities. This, of course, allows a reader to quickly ingest valuable info, while unfortunately also allowing the now-made-easy possibility for said reader to misunderstand said info. Also, I am not trying to imply that you have misunderstood anything I have written. Rather, I intend for this reply to be a compliment to your clarity of thought and communicative abilities. On the other hand, I have been told by some that my compliments can and do sometimes feel like insults. I am not quite sure what to make of that. In either case, two words which I used in my previous post and which I feel could use some clarification are the word "robots" and the word "rich." The word 'robot', as a device, is quite specific, but that same word, in its purpose, is quite general. As such, we can use the word 'robot' to define either a specified thing, namely, a "mechanical device that is capable of performing a variety of often complex tasks either on command or by being programmed in advance", or we may equally use that word to an acceptable (but maybe more confusing manner) to simply reference its purpose,namely, that a robot is "a device used to perform or facilitate manual or mechanical work." Both definitions work, but each communicates a different conceptualization of information. For instance, when using the second definition, one realizes quite quickly that many devices (not just programmed mechanical devices) are used to facilitate manual labor, and as such, their use is incredibly valuable in improving wealth while simultaneously destroying jobs. For instance, take the tractor. It's purpose is to facilitate manual labor, and it has driven down the cost of food dramatically. In the 60's they said we would all die horribly of starvation due to a lack of food resulting from overpopulation, yet at this very moment, the price of soy beans is at record lows despite our population being at record highs. The point is that the second definition (that of purpose) shows that those who fear that robots will destroy our jobs were also the very same kind of people who feared that tractors would destroy our jobs. And what kind of people was that? I'll put that as simply as the English language will allow: they are idiots. And this brings us to the topic of being "rich" (a very misunderstood word). Most people assume that being rich means having lots of stuff (or: material wealth as the dictionary likes to call it). The reason why this word is so easily misunderstand has to do with one's reference point. If our reference point is 'our peers', then yes, robots who cause us to lose our job today will seem to make us poor "in the present" compared to our peers who still have jobs today. But this is a very short term perspective on what usually ends up being a very long term life. Since human lives tend to last longer than a day or a week, it seems much more reasonable to use past generations as our reference point to determine who is rich and who is not. The following info comes from Basic Economics by Sowell: "Most American 'poor' do not stay poor. Four-fifths of American millionaires earned their fortunes within their own lifetimes, having inherited nothing. A large majority of those in the bottom 20% in income in 1975 were also in the top 40% by 1991. Among those individuals who were in the bottom 20% in 1975, 98% had higher real incomes by 1991. Moreover, two-thirds of them had higher real incomes in 1991 than the average American had back in 1975. The real incomes of those households in the lowest bracket rose by thousands of dollars in absolute terms over that time." In other words, poor people, by 1991 became what they would have considered "rich" had they used 1975 as their reference point. But most people don't think like that. They compare themselves to others in the present, using only today as their reference point, rather than considering the long journey that allowed them to get to where they currently are. The point is that although robots (and tractors) may make some people temporarily poor in the very short term, in the long term, robots (and tractors) dramatically improve the wealth of everyone, thereby making everyone rich (compared to where they would have been had the robots never arrived). On the other hand, I have been told by some that my compliments can and do sometimes feel like insults. I am not quite sure what to make of that. Chad, my boy, you are such a fine fellow that nobody is or could take anything you write as an "insult"! Not possible.! Even I, the grand champion of the thin -skinned, could not. So there you go!